Think traveling with just an underseat carry on is impossible? To get you started, we’ve rounded up a list of the best under seat luggage and we’re showing you how to pack strategically to make the most of low-priced airfares. Find out how! Airlines are constantly downsizing their offerings, and in the latest move to offer basic economy fares, some airlines now charge for carryons making use of the overhead compartments. Before you worry, let me clarify. Several US-based airlines have now added new basic economy fares with competitive pricing but without luggage options. While this move has received much criticism, this isn’t necessarily a negative. I spoke to a representative from a major US airline carrier and they explained their decision to offer this new basic fare. To summarize, the major airline carriers in the US want to offer budget-friendly airfares similar to the low-budget carriers such as Southwest, Jet Blue, and Spirit. These low budget carriers charge a minimal fee for a seat but make their money upselling other items such as luggage space and food. Europe’s budget airlines, RyainAir and EasyJet, have done this for years and now American based airlines are catching up. Savvy travelers can benefit from these fare wars and see this an opportunity for more budget travel options within the US; which has been expensive to travel domestically compared to Europe. Let me show you how you can downsize your belongings to take advantage of these fares and travel only with a “personal item” such as the underseat luggage featured below. In order to travel just with a personal item you need to first choose the perfect underseat carry on. This bag has to fit perfectly under the seat of domestic airlines all while providing you ample room for everything you need to bring. To be honest, an underseat carry on isn’t drastically smaller than a regular carry on. However, it is important to note that the dimensions of the bags and the space under the airplane seats will vary between airlines. Visit the website for the airlines you travel most frequently in order to choose the most versatile option. Tip: the middle seat has the most space and it’s usually the least expensive! Keep this in mind when booking your flight. Traditional “underseat luggage” features wheels, which many find more convenient than a regular shoulder bag or backpack. 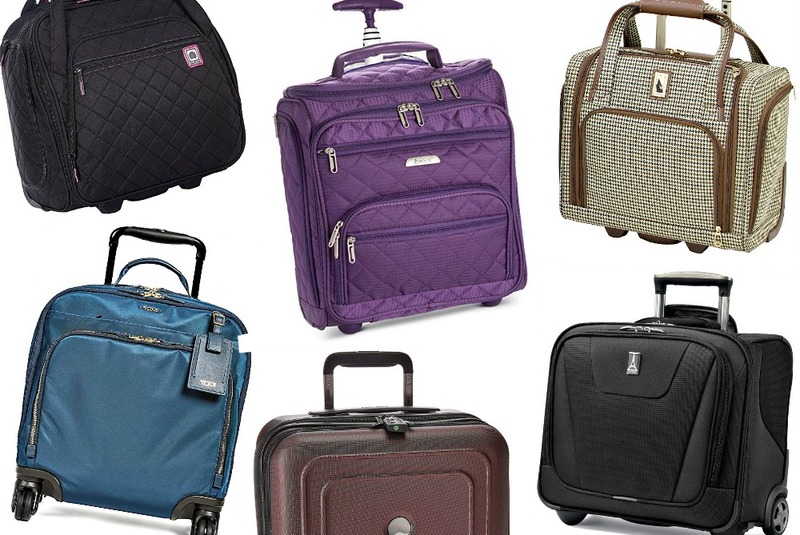 For the sake of this article, we’ve focused specifically on wheeled underseat carryon styles but you can also visit this post for ideas on weekender bags. One of the biggest challenges with trying to find the best under seat luggage is that the majority of styles are designed for business travel. Consequently, this limits the space available for clothing and shoes. Rest assured, the underseat luggage we’ve featured in this post offers the most spacious interior maximizing the space available for your belongings! Samsonite is on our list of the top luggage brands and this wheeled underseater makes this list, too. This durable luggage is built to handle the harshest of travel elements thanks to its polyester and nylon fabrics featuring excellent wear properties. Your luggage will look as great on the 100th trip as it did on the first. 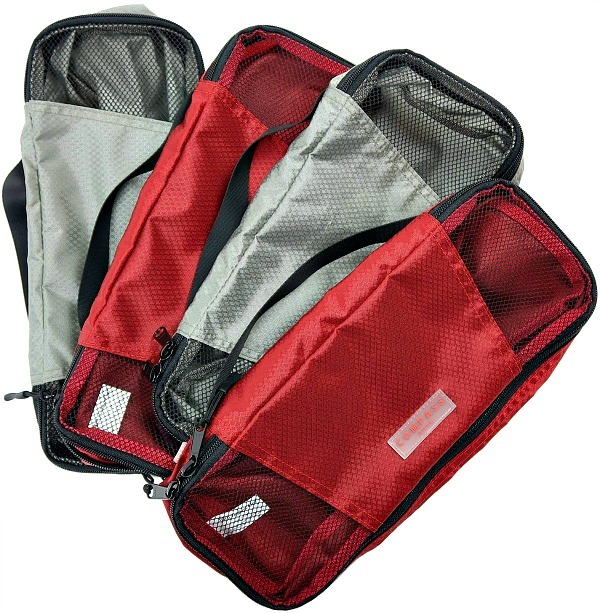 The zippered compartment allows you to separately pack damp or soiled items, while the removable 3-1-1 pouch and removable, hanging organizer pouch make it easy to organize all of your essentials. Buy it here! Travelon is one of our readers’ favorite brands, especially when it comes to anti-theft products such as purses and money belts. They also happen to have a few awesome travel products not related to theft including their Wheeled Underseat bag. It weighs 5.4 pounds and gets rave reviews from our readers. The bags best features include a convenient zippered water bottle pocket, and an “add-a-bag a sleeve on the back to fit the handle of a larger piece. Buy it here! 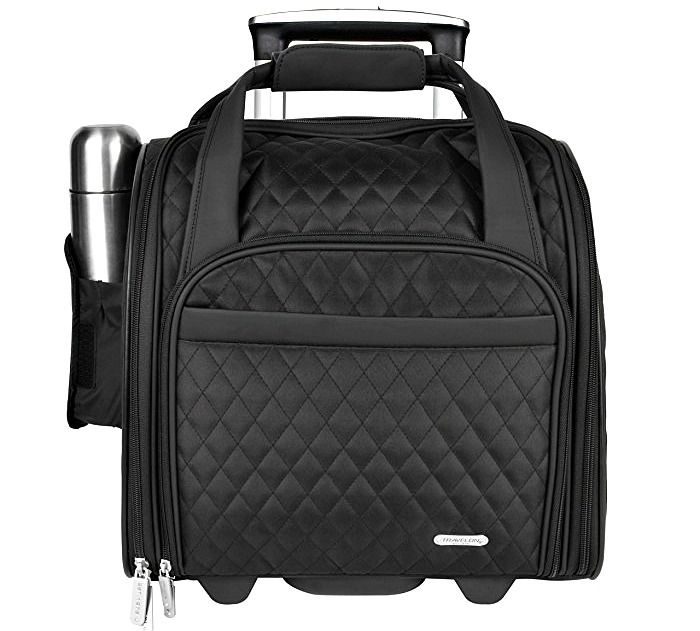 Delsey quilted rolling underseat tote couldn’t be lest off our list. While it has various organizational pockets, it still has a roomy main compartment, which is enough to pack clothing and a pair of shoes. As a plus, it’s also available in two pretty blue colors! Buy it here! After searching high and low for the best under seat luggage, the closest I got was the Sky Max 2 by Delsey. This bag conveniently features nine pockets and is supposed to fit under the airplane seat of most airlines. It ticked off most of the boxes including a nice wide open space so you can organize your belongings the way you want to. Underseat luggage tends to have too many compartments limiting their use to business documents. This bag, however, has a spacious interior where you can fit just about everything you need for a simple travel itinerary. At 4.6lb, it’s the perfect weight to adhere to limited baggage restrictions. Buy it here! Read these tips on how to pack for 5kg baggage allowance! 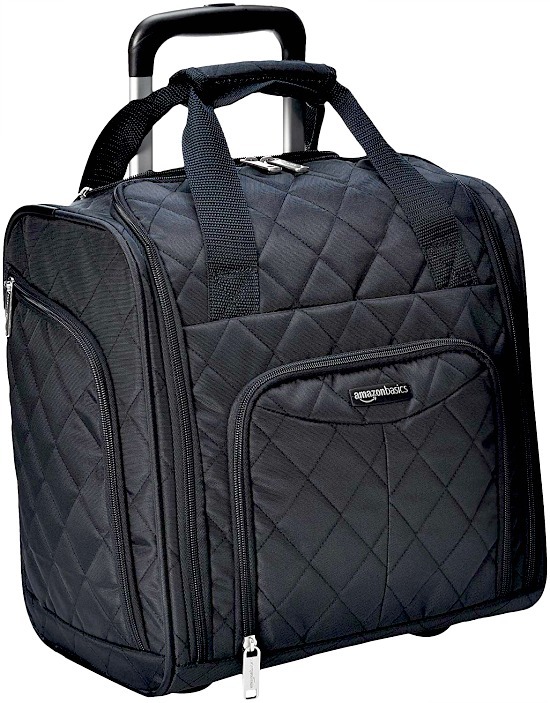 Travel in style with the AmazonBasics underseat luggage featuring a trendy quilted design. Along with its good looks, it’s compact in size, offering useful storage space, a telescoping handle, and smooth rolling wheels. The bag has a roomy main compartment, several interior pockets, and a handy front organizer so everything has a space for easy access. Whether you’re headed on an overnight business trip or a weekend getaway, this durable and high-quality underseat luggage makes traveling a breeze. Buy it here! At TFG, we’re big fans of Travelpro and their Maxlite bags. The latest version, the Maxlite 4, is one of the best underseaters for flights. The bag’s best feature is the wide open space. We like the fact that it does not include a compartment for a laptop or business documents because that means that’s it’s much more functional as a carry-on bag. Popular with pilots and flight attendants, the main downside is the 6.6lb weight, so you’d only be able to use it on a flight with a generous carry-on allowance. Buy it here! Aimee Kestenberg has some of the most stylish prints available and we couldn’t exclude this carry-on from our list. The colors and designs are absolutely beautiful, and this looks more like a trendy handbag than luggage. This bag features a front exterior pocket with a padded tablet pocket and numerous business pockets, while the main compartment includes two zipper pockets, garment restraints, and two elastic open top pockets. Two side zipper pockets offer additional easy access storage. Fashionable and functionable? Impressive. Buy it here! 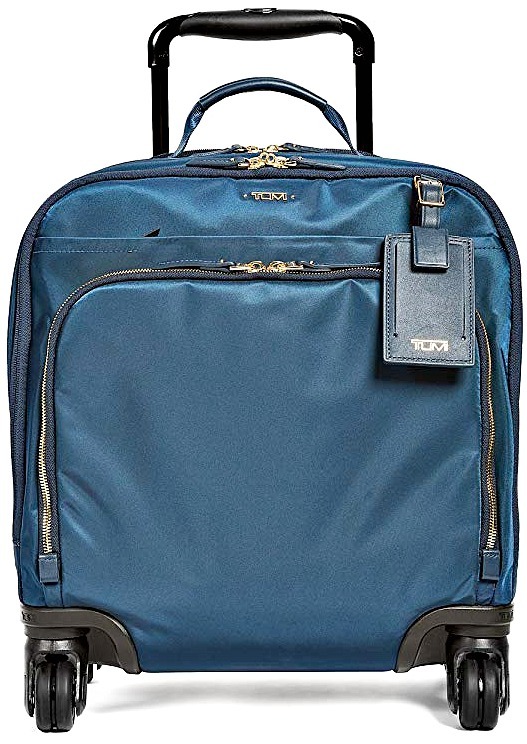 For a bit of luxury, Tumi has the good looking, feature-packed Oslo Voyageur Compact Carryon. It’s small enough for easy storage on planes yet large enough for clothing, too. It has usefully laid out compartments that aren’t limited to use for business travel. 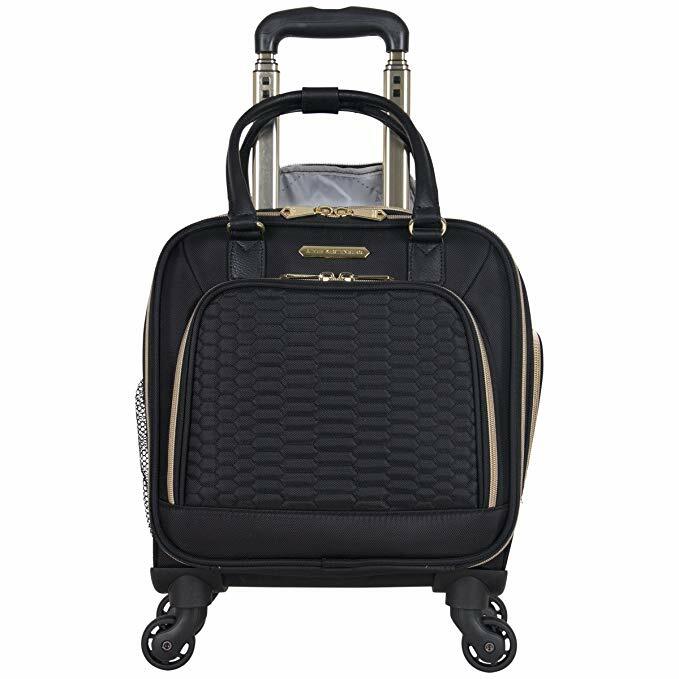 It’s water resistant, has a sleeve for stacking onto other rolling luggage, and even has 4-wheels so you can easily wheel it down the plane aisle. Unfortunately, it’s more expensive than the other bags listed here. However, that’s the price you pay for a Tumi bag. Buy it here! The last one by Delsey on our list of the best under seat luggage is the Ez Pack. The minimalist, clean design with spaciousness is exactly what we want in a small carry on! Big points for the wide open space! Buy it here! The Cruise Lite Hardside 2 is another win by Delsey. It’s actually the first wheeled underseat carryon and weighs 5.6lb. While it doesn’t have a strap to be layered over a larger suitcase, this is the ideal option for someone who strives to pack light enough to travel with only an underseat carry on or a business traveler on a 1-2 day trip for meetings. Buy it here! If you’re looking for a stylish under seat bag then the 16.5-inch Aerolite with wheels is a great choice. 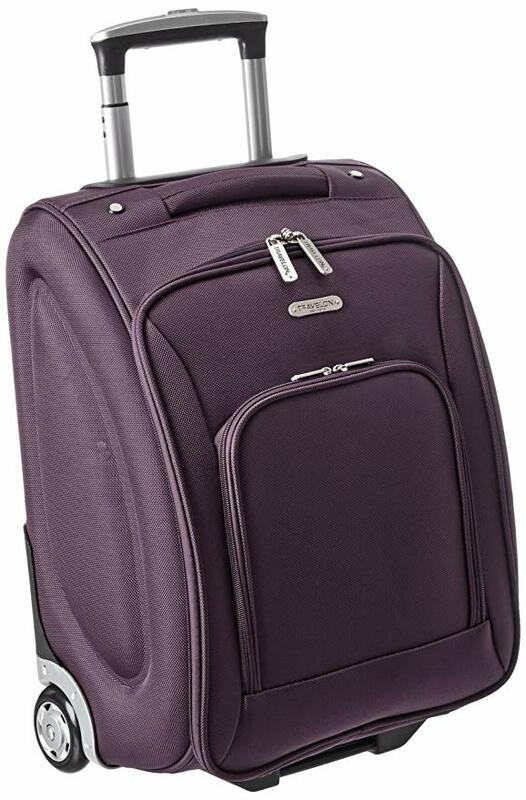 Travel with easy and style with this cute purple carry on! You can cart this compact carry on through the airport with ease due to its 2-wheel roller system and retractable extending handle. It fits perfectly under almost any airplane seat and is airline approved by some of the most popular US airlines. This carry on is perfect for the fashionable traveler that wants to keep her belonging safe in and out of the airport due to the 3-digit lock that’s included. Plus, we all know the importance of staying organized during your travels and this airport bag has built-in organizational pockets (the big one is perfect for using some of those fancy Compass Rose packing cubes you have)! We particularly fancy the purple, but if you’re looking for an edgier color to show off your style, this cute carry on also comes in a bold red. Keep your belongings secure and your travel style on-point with this cute and durable, quality carry on. Buy it here! Not only does London Fog make classic trenches, this brand also produces trendy and practical under seat bags. At 15”, this carry-on is designed to comfortably fit underneath most airline seats so you can easily access everything you need while flying. 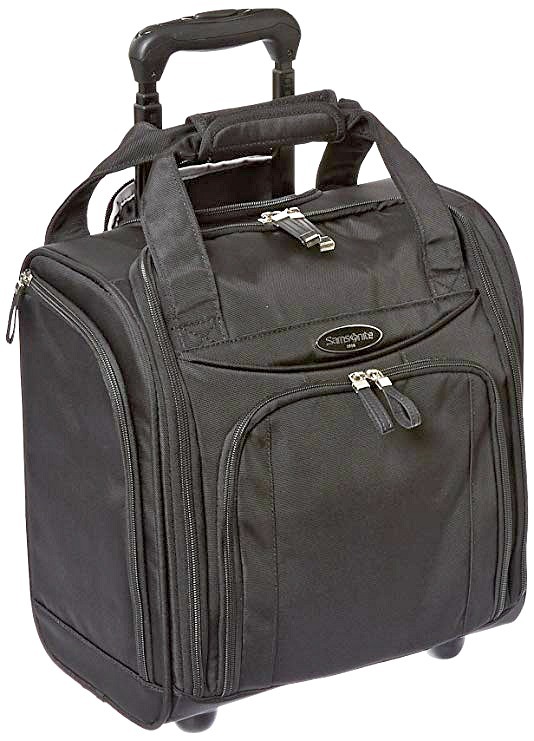 The wheels make this easy to use as a rolling tote, a business case, or an overnight bag. Along with a roomy interior, the bag has 2 clear zip water-repellent pockets, a zip mesh pocket for accessories, and a padded tablet compartment, while the exterior has two front and two side zip pockets. Buy it here! 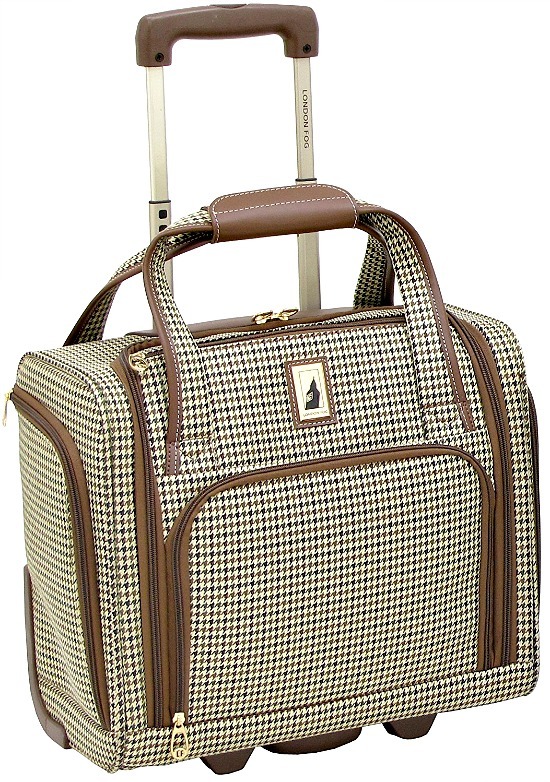 Another reader favorite, this under seat bag by Travelon is a good buy. Its roomy main compartment has enough space for a couple of packing cubes and maybe even a thin pair of shoes such as ballet flats or sandals. One traveler packed a pair of shoes, iPad, rain jacket, a pair of pants, 3 shirts, a skirt, two socks, a few undies, and a small Ziploc bag with toiletries. We’re impressed! It has a front organizer that can holds a tablet, travel documents, or other small essentials. As a plus, it also holds a 15.6 inch laptop but this is a nicely built-in feature that doesn’t compromise space. The major downside is that it doesn’t fit under the seat in all airlines so it might be best used as a smaller carryon for the overhead bin. Buy it here! 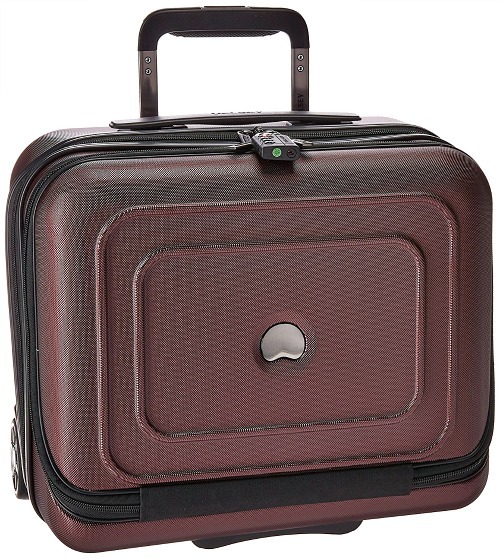 Samsonite Wheeled Underseater	 This durable luggage is built to handle the harshest of travel elements thanks to its polyester and nylon fabrics featuring excellent wear properties. Travelon Wheeled Underseat	 The bags best features include a convenient zippered water bottle pocket, and an "add-a-bag a sleeve on the back to fit the handle of a larger piece. 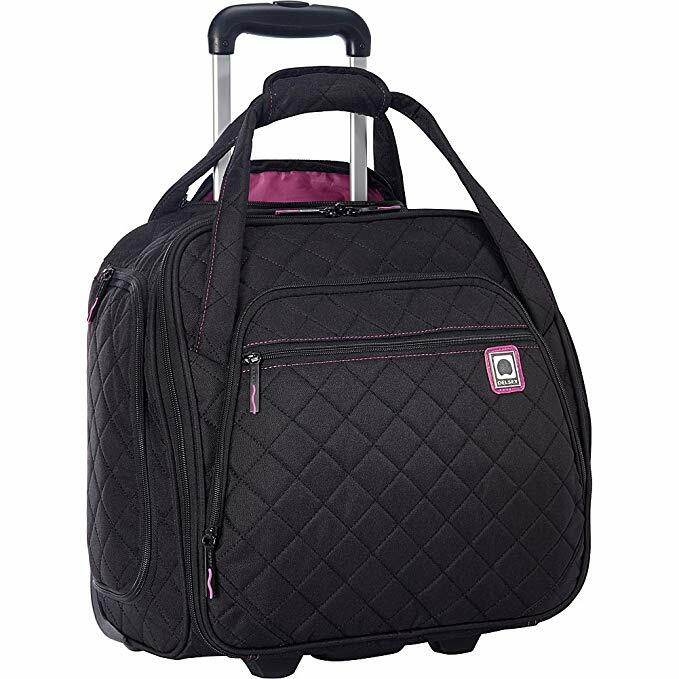 Delsey Quilted Tote	 While it has various organizational pockets, it still has a roomy main compartment, which is enough to pack clothing and a pair of shoes. 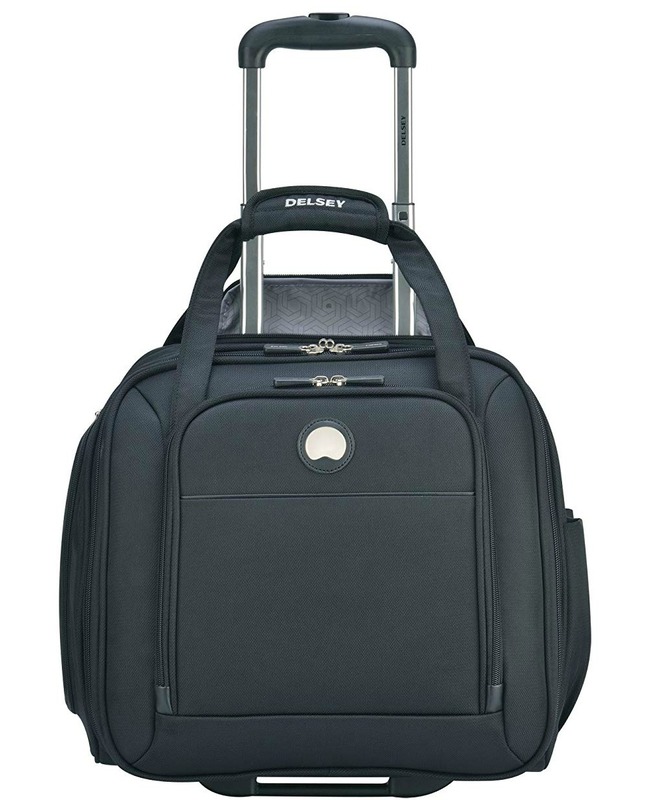 Delsey Sky Max 2	 At 4.6lb, it's the perfect weight to adhere to limited baggage restrictions. AmazonBasics Underseat Luggage	 Along with its good looks, it’s compact in size, offering useful storage space, a telescoping handle, and smooth rolling wheels.
" Travelpro Maxlite 4	 The bag’s best feature is the wide open space. We like the fact that it does not include a compartment for a laptop or business documents because that means that’s it’s much more functional as a carry-on bag. Aimee Kestenberg Underseater	 This bag features a front exterior pocket with a padded tablet pocket and numerous business pockets, while the main compartment includes two zipper pockets, garment restraints, and two elastic open top pockets. Tumi Oslo Voyageur	 It's small enough for easy storage on planes yet large enough for clothing, too. Delsey Ez Pack	 The minimalist, clean design with spaciousness is exactly what we want in a small carry on! Big points for the wide open space! Delsey Cruise Lite	 While it doesn't have a strap to be layered over a larger suitcase, this is the ideal option for someone who strives to pack light enough to travel with only an underseat carry on. 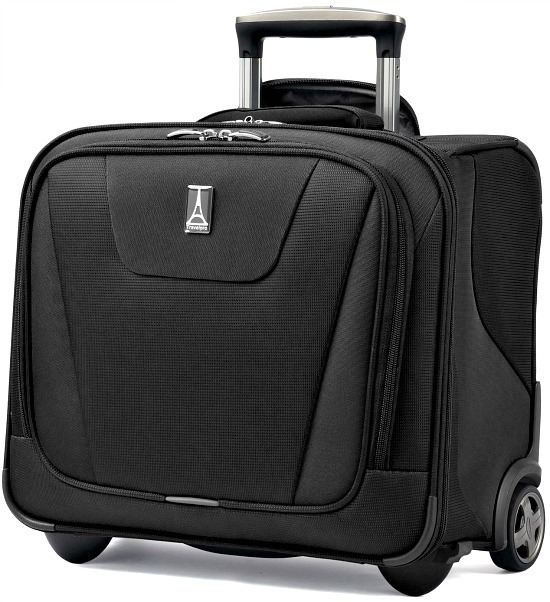 Aerolite 16.5" Underseat Luggage	 If you’re looking for a stylish under seat bag then the 16.5-inch Aerolite with wheels is a great choice. 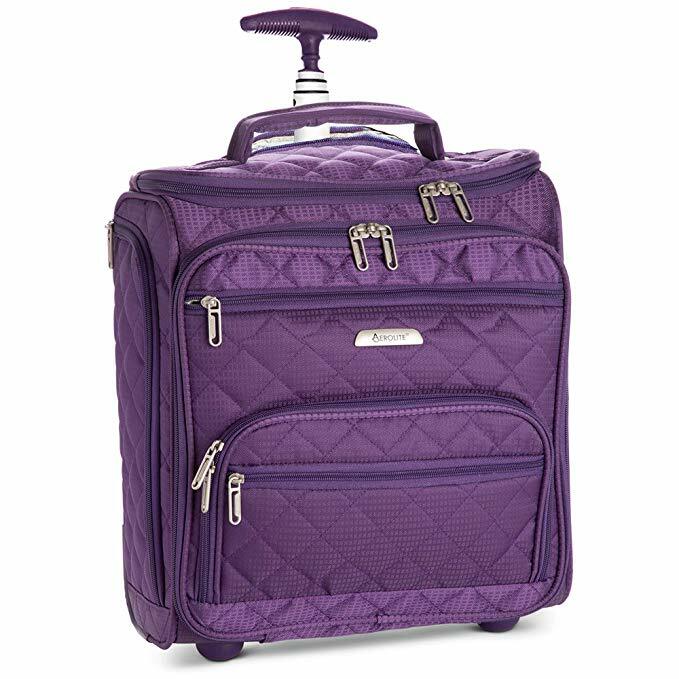 Travel with easy and style with this cute purple carry on! London Fog Cambridge	 At 15”, this carry-on is designed to comfortably fit underneath most airline seats so you can easily access everything you need while flying. 18" Underseater by Travelon	 One traveler packed a pair of shoes, iPad, rain jacket, a pair of pants, 3 shirts, a skirt, two socks, a few undies, and a small Ziploc bag with toiletries. We're impressed! Once you’ve chosen the best under seat luggage for your trip, use packing cubes and other luggage organizers to organize and compress your clothing tightly to make the most of less space. There are a variety of packing organizers ranging from compression sacks to packing cubes to ziplock bags. Personally, we like using these packing cubes and our readers agree. They’ve helped millions of our readers travel carryon only – learn more! The idea of packing in a packing cube may seem impossible, and it is if you don’t plan strategically. To make this a reality, use our signature capsule wardrobe framework that show you how to downsize your clothes for any trip to take only what you need to avoid overpacking. We recommend starting with our ten-piece travel wardrobe and revolving or adding items as needed. Need more clarification? Read our packing ebook, which reviews the capsule travel wardrobe concept on detail showing you exactly how it’s possible to pack light for every trip. Once you’ve managed to downsize your clothing, the next big challenge is downsizing your shoe collection. When traveling with only one underseat carry on, you want to bring no more than two pairs of shoes and plan to wear your heaviest pair on the plane. Make sure you follow these guidelines so that the two pairs you bring are versatile and mix and match with all your clothing. Don’t forget that comfort is the number one priority. The wrong pair of shoes can ruin your trip! Read our ultimate guide on how to choose travel shoes for more details! Lastly, it’s time to downsize your toiletries, hair styling tools, and makeup. Our Ultimate Guide to Travel Toiletries shows you exactly how to pack less beauty products without giving up your favorite things – plus it has a free printable toiletry list! Next, create a capsule makeup collection so you can make the most of mess stiff without sacrificing your beauty routine. If your hair is high maintenance, consider bringing a compact multi-tool like this one. Tip: These travel containers are my secret to decreasing my beauty products and toiletries for any trip! 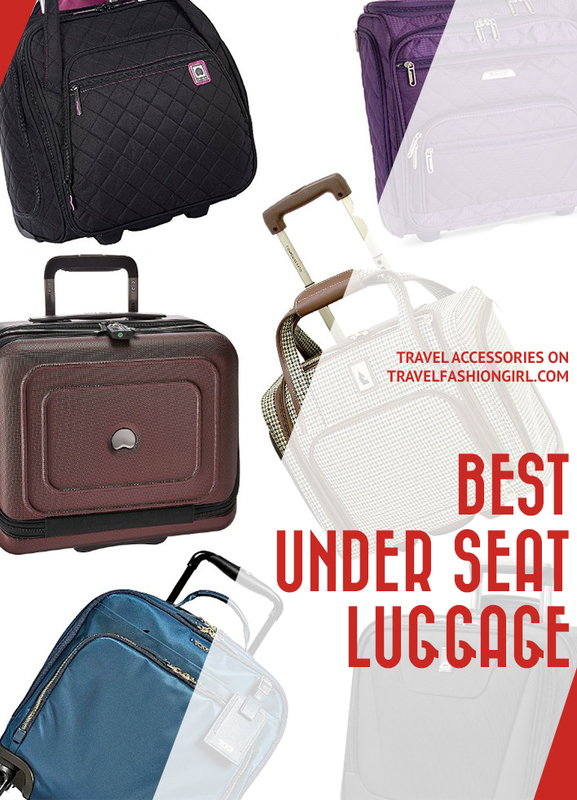 What do you think is the best under seat luggage? Share in the comments below! I hope you liked this post on the best under seat luggage. Please share with your friends on Facebook, Twitter, and Pinterest. Thanks for reading! My Osprey Ozone 18” fits under the aisle seat in Southwest, the airline I usually travel on. I love it! Hi Barbara, thank you for sharing your go-to under seat luggage with us!! Happy travels! My daughter is a young violinist who travels to lessons via air a few times a year. The trips are usually long weekends (Fri-Sun) and she takes the 13.5” Delsey Quilted Underseater for her clothing. Her violin counts as her carryon and goes in the overhead, leaving her with only a personal item for clothing if she doesn’t want to check a bag under the plane. She wears her heaviest shoes and brings another dressy pair in the carryon (black ballet flats). She’s been able to make this work for every trip. She must pack her music, metronome, recording device, chargers, toiletries, etc. in addition to her clothing in the Delsey carryon. She uses packing cubes and wears the same outfit for travel days. This underseater has been perfect – we absolutely love it! Hi Ashley, thank you for sharing your daughter’s packing experiences with us! Sounds fantastic, and love all your daughters travel packing hacks! Eagle creek has an under seat sized bag 13” x13” x 8.5”. It has a front pocket large enough for a large iPad, one side pocket( wish there were two), top unzips for easy access to interior. It weighs approximately 4.5 pounds. It is very durable, well made of quality material. I’ve used it on 8 out of country trips and at least 16 in state trips. sure wish there was a smaller rolling bag out there, 12” x 12” x 6” that could be converted into a backpack, having a pocket on each side, iPad pocket and a band in back to go over suitcase handle. I travel with an 18” in which I carry no more than 25#, want to downsize more, and my eagle creek underseat bag. Being a seasoned traveler I want to carry less so all is easily manageable for me and by me. Hi Dona, thank you for sharing your recommendation for under the seat luggage, always enjoy hearing about our readers’ favorite brands. Happy travels!! As an FYI… Bags (two) fly free on Southwest Airlines and there’s no charge for drinks (soda, water, juice) on Southwest either.